Morning all! I always get asked about what makeup brushes I use - my favourite brushes are from Sigma - I've had the Essential Kit (€67/£56/$89) for nearly 2 years now. I use the brushes daily, and they're in perfect condition. I also own brushes my Face2, Real Techniques, Urban Decay, M.A.C and No.7, but I still find my Sigma ones to be my most reached for! They wash fantastically, and barely shed. 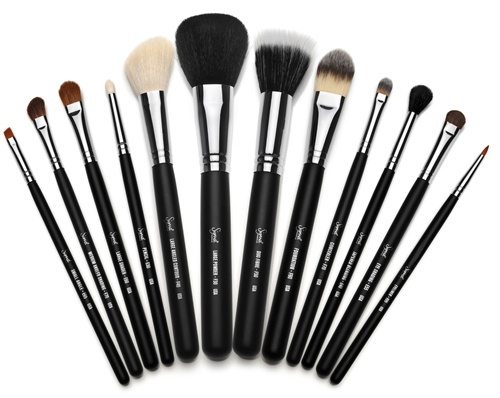 Sigma brushes are proven to be as good, if not better, than M.A.C brushes. I've never really felt the need to buy M.A.C brushes, because I find them really expensive; I own the 217 brush but that's it. I'm happy enough with my Sigma brushes. I use most of the brushes in the Essential Kit daily, and my favourite ones from the kit are definitely the E40 Tapered Blending Brush and F60 Foundation brush. I only have sheeding problems with the F50 Duo-Fibre brush, but it's nothing to extreme. I only use it for contouring, not foundation application, so there's never brush hairs all over my face! My package arrived within a week from the USA, when I ordered my brush kit. (Sigma DO ship to Ireland, click the 'Republic of Ireland' choice in the drop-down list.) They were packaged beautifully in a mesh bag, and came with a full guide on how to use and take care of the brushes. I also received a complimentary travel-sized blending brush with the kit. Overall, I give the kit 9/10 - the point knocked off for the Duo-Fibre brush shedding. I'd highly recommend them to anyone; I don't see why people spend money on M.A.C and other cosmetic brands' brushes, when there's amazing Sigma ones available at a fraction of the price?! Sigma also sell makeup palettes, cleansing tools and much more, check them all out here!